Whether you’ve been on LinkedIn for many years or you just created your LinkedIn profile, no doubt you have questions about how this particular social media platform works and how you could be using it more effectively. While I’ve been on LinkedIn for 11 years, I too, have my questions, especially as it relates to connecting with others and building win-win business relationships. 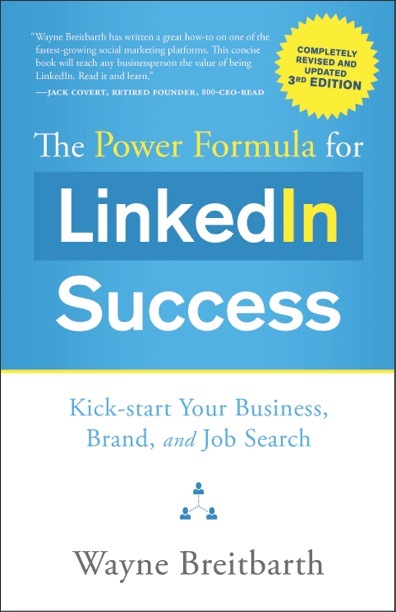 So, I turned to Wayne Breitbarth, LinkedIn expert and author of The Power Formula for LinkedIn Success: Kick-Start Your Business, Brand and Job Search, to obtain a better understanding of how to use LinkedIn more effectively. On LinkedIn since 2007, Wayne has thoroughly studied this platform and has given hundreds of seminars and workshops to educate businesspeople on how to use LinkedIn more effectively. During our hour-long conversation, I asked Wayne questions that I think are on the minds of many LinkedIn users, such as you. Questions about how to write a Profile that catches the interest of another person, such as a recruiter or potential client; how to respond to people looking at your profile, and how to use LinkedIn in connection with other social media platforms, such as Facebook, Twitter and Instagram. Stephen Dupont: Wayne, how did you begin your experience with LinkedIn? So I clicked it open. Stephen Dupont: Are you still in the furniture business or have your book and your seminars about LinkedIn turned into a full-time business? Wayne Breitbarth: Yeah, teaching others how to use LinkedIn has become a full-time business for me. I’ve been on LinkedIn for eleven years, and for the first six years I was still involved in the office furniture business, while I was building my expertise in selling and job hunting with LinkedIn. Stephen Dupont: How did that transition occur? Wayne Breitbarth: I would credit the success of my transition to a couple of things. The book took me to national prominence, no question about it. So, that was important factor. Another thing that was important was that first year of teaching LinkedIn classes. I taught 105 classes, Stephen. For free, on top of my day job. This was before I wrote the book. I spoke to tons of people and I started to build a mailing list during that time, which was key to promoting the book when it came out. I would say the third thing is that my timing was perfect because it was at a time when everybody was getting a profile on LinkedIn, but nobody knew what they were doing. I just became one of those few guys that studied it enough that I knew what I was doing. Well, it wasn’t as bad because the last two years at the office furniture business, my partner and I had struck an arrangement where I would cut back my pay in exchange for more time to see if I could make a business that could support my family. So, I didn’t have to go off the cliff, you know. So that was really helpful. I realized that we’re going to be fine. And I’d like to add that this all occurred when we still had kids under our roof and we’re paying for one who was in college. Stephen Dupont: It sounds like having that business partner who was supportive of you also helped a lot, too, right? Wayne Breitbarth: Yeah, it really was. Stephen Dupont: What do you think helped the most in securing your reputation as a leading authority or expert? 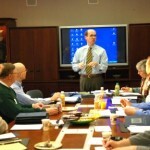 Wayne Breitbarth conducts early morning LinkedIn Speed Training Seminar. Wayne Breitbarth: I think it was speaking. I spoke every chance I could. It not only allowed me torefine my ideas and answer real-life questions, but it allowed me to start building an email list, and a group of supporters who wanted to receive my weekly LinkedIn tips. Stephen Dupont: Did you start speaking to groups such as Rotary Clubs and chambers of commerce? then I was starting to have people call me from all over the region to speak and give workshops – chambers of commerce, industry associations, etc. That’s when they started to call me, and that’s because invariably, someone at one of those first presentations saw me speak and recommended me to these other organizations to which they belonged. By year three, I was not doing rotary clubs anymore. Not that I didn’t love those guys and care about them, but they were 20-minute free talks that I just had to take out of my schedule. Because by then, I had to get serious about monetizing this thing. Stephen Dupont: How do you think someone should use LinkedIn in building their personal brand? 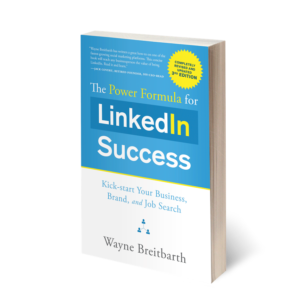 Wayne Breitbarth: LinkedIn is a really important component of branding yourself because it’s a source that’s free, and it’s online – and most people are online. I think the best strategy for most people in marketing themselves is to have a really, really solid profile with good experiential stories about who you are, where you’ve been, and what you’re capable of. In addition, LinkedIn gives you the power to consistently connect with people that you think some day you could help or they could help you. So, it really boils down to this question: “What is your professional strategy, at least as you see it today?” Build a profile that supports that strategy and also build a network that supports that strategy. Stephen Dupont: How do you think someone should use LinkedIn for business development, such as finding new clients? After all, that’s the way you started to use it – to find new customers to support your furniture business. I think a lot of people think that they can just start a profile of themselves or their business and the customers will just start coming out of the woodwork. Wayne Breitbarth: When you use LinkedIn for business development, use the multiple search features on LinkedIn. You start by identifying your audience. So, for example, when I was in office furniture I was looking for facilities people – people in charge of buying furniture for their offices. Or, if I knewthat a company was moving to a new space — because I read about it in the newspaper or a friend told me – then I would look up who the president or CFO was on LinkedIn and begin the process of introducing myself and building a relationship with them. Wayne Breitbarth: I’d start with a person’s title, the companies they are or have worked for, and the industries in which they participate. That kind of stuff. Then you start to search them out on LinkedIn, and try to connect with them. Once you connect, you try to turn that connection into a meeting, or a phone call, or whatever you do next as part of your sales process. It’s not simply about adding connections. If there’s not a goal involved and a process to act on your connections, then all you’re using LinkedIn for is, like, to collect baseball cards. I said, “When was the last time you went into your 1,300, sorted them, and filtered them by the kind of people you’re looking for? And then, you did something, either through email, phone call, or LinkedIn messaging to reach out to the right people out of the 1,300, and invite them to a webinar, or do an event with them. Something. Anything. Because remember, just because they’re in your network doesn’t mean you already sold to them. They may be a better prospect than the brand-new person you’re going to ask this afternoon. So I say, why not go to them first? It might be their day to finally switch accounting firms. Stephen Dupont: So, it sounds like what you’re saying is that LinkedIn is a great way for people to get to know you and recognize you for your expertise, but ultimately, if you want to build a business (e.g., get customers), you need to take the next step and start engaging with those people in your LinkedIn network. In fact, it would be better to do that first than to add more people to your network that you’re not going to engage with. Right? Wayne Breitbarth: Yes. You got it. Stephen Dupont: How do you think a person should use LinkedIn more effectively for job hunting? Wayne Breitbarth: For job hunting, and by this I mean that you’re actively searching for a new position, there’s one thing that you better make sure you do – use better keywords to optimize your profile along with your résumé. Many talent recruiters are using software to scan digital résumé, or your LinkedIn profile to find out whether you have enough of the keywords that they’re seeking, or that you have the right keywords, to make their first cut. And that is killing people. You could be the best person for a job, but if your resume or LinkedIn profile doesn’t cut it (have the right keywords or enough of the right keywords), you won’t be invited in the front door. So, the first step is to better understand the keyword systems that are out there, and how LinkedIn and your résumé need to be optimized. Second, I would use LinkedIn to search for people who work at the companies you’re interested in working for, and try to work your way into those organizations, even if there’s not a job posting. Because you know down the road – if there isn’t a job posting today, if you can make some friends, move into an organization virtually, using LinkedIn, then maybe your name will pop up in a meeting when they say, “Yeah, we better post that job.” Then they go, “Wait, I just talked to – I got a friend,” and boom, you’re in the door for an interview. So, in order to link into the conversation – even if there isn’t a job posting – try to work your way into the conversation. How? Look for people who went to your high school or college who are currently working at the company you’d like to work with. Look for friends, family members, former co-workers, who work there now, or are linked to someone who works there, and ask for an introduction. Stephen Dupont: Let’s talk about keywords. Let’s say I’m looking for a job in marketing. I want to be a marketing vice president working for a company in the energy industry. So, are you literally putting into your headline next to your photo, your description and your job history words such as “marketing,” “vice president,” “energy,” etc.? Wayne Breitbarth: Yes. Listen, you don’t even have to guess at this. Go to the job postings on LinkedIn or another job website and look at the keywords in those descriptions. Those are the keywords you need in your profile and resume. The software will find the best matches. Here’s a tip: There is actually a tool about that. It’s a tool called JobScan.co. It allows you to paste in ajob posting, and then paste in a job résumé – or your LinkedIn profile – and push the word, “scan”, and it will tell you how good of a match you are, as well as what keywords you’re missing. Stephen Dupont: If you connect with somebody on LinkedIn, would you call that networking (in other words, the people who’ve accepted your invites are your network)? Or do you think LinkedIn is a tool (among others) with which you use to network? Wayne Breitbarth: I see LinkedIn as a form of networking. Do I think that it supports traditional networking, as you say? Yes. Part of this depends on where your customers are. Do they expect to meet with you face-to-face? Do they expect to meet you before they sign on the dotted line? There are some customers where that’s not important. So I think it could be either. Stephen Dupont: But certainly, maybe, in combination, it would be much more powerful? Wayne Breitbarth: Oh, for sure. I think face-to-face meetings and phone calls are typically considered homeruns. But these days, we’re not far from the days when normal business transactions take place without a meeting or a phone call. I mean, I’m 61, so I didn’t grow up on that. Then you have to look at the generations coming up. To a Millennial, when you say, “face-to-face,” they might say, “Skype-to-Skype,” right? Stephen Dupont: In your experience in working with people who attend your workshops and seminars, what is one of the most overlooked features of LinkedIn? 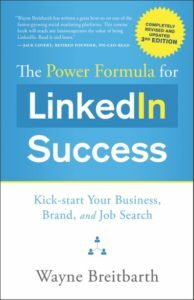 Wayne Breitbarth: I would say, the ability to do what I call an “Advanced People Search.” So, look for the Search bar on the top of your LinkedIn page. Most people only use it for typing the name of a person they’re looking for. Most don’t understand that if you put your cursor in that box, a menupops down, and it says, “search for” and your first choice is “People.” You click “People”, and then youclick on the next page, “all filters”, you’ve got 13 filters to take 580 million people on LinkedIn down to the exact 15 people you’re looking for. Because it’s hard to find, most people have not discovered this feature. It’s not their fault – LinkedIn doesn’t make it easy to find. Here’s the thing – you can do this search for free, Stephen. You don’t need a premium account to do this. Stephen Dupont: I’m assuming that that’s a feature that a lot of recruiters use to search for potential candidates, correct? Wayne Breitbarth: Yes, that’s exactly right. Now, the recruiters have more filters than those 13 or 14 that you get for free. You know, they pay more for LinkedIn, and they get more filters. But, it’s the same idea. Taking the list from 580 million and getting it down to the right six, or ten, or 12, or 25? Stephen Dupont: With the feature, “Who’s Viewed Your Profile,” have those people actually looked at your profile? And what should you do if someone has looked at your profile, such as someone who might be a potential client, or someone who works at a company that you might like to work for? What should you do next to connect? Wayne Breitbarth: So, the answer to your first question is yes, they actually did look at your profile. How long, we don’t know. Maybe only for seconds. Second, if they are interesting to you, you should reach out, and send a connection request. Or, if you’re already connected, send a message. By the way, Who’s Viewed Your Profile is the number one-rated feature on LinkedIn. I do a survey every year of the people on my email list, and I ask questions such as: “How many connections do you have? How many groups do you have?” And one of the questions is, “What’s your favorite feature?” That is the number one rated feature for the last four years. Stephen Dupont: How should someone better use that feature? Wayne Breitbarth: Here’s the way I like to teach someone how to use that feature. Assume that your profile is like a storefront in a strip mall. If someone walks into your store and looks like a buyer are you going ignore them? No way. Because if you ignore them, they could walk right next door into the LinkedIn pages of others who do whatever you do (accounting, lawyering, public relations, advertising, insurance, etc.). Next thing you know that “Hi” turns into a client. Wayne Breitbarth: I know. That’s the funny part! So, what happens when you send a request to connect, and they never get back to you? What does that mean? Well, it means that they didn’t want to connect. I don’t know why. But I do believe that while they’re there visiting your profile, why not try? Stephen Dupont: How do you think you should send a more personal message that might turn into a relationship? Do you write something such as, “Hey, I see that we know some of the same people,” or, “I see you work at a company that I’ve always wanted to work for,” instead of just hitting the generic Connect button? Wayne Breitbarth: You should always customize your invitation. Stephen Dupont: Is there any line or anything like that, that you’ve noticed tends to work better than, “Hey, let’s connect”? 1.) Jim Smith, a client for over 15 years, suggested that we connect. He thought you might be interested in having a chat about how we could help your organization. If that’s the case, let me know. In the meantime, I would be honored to have you join my network. 2.) Jim Smith, a member of my LinkedIn network, suggested that we connect. He thought you might be interested in having a chat about how we could help your organization. If that’s the case, let me know. In the meantime, I would be honored to have you join my network. 3.) I noticed from your profile that you attended Marquette [or are a member of a group, used to work at a particular company, etc.]. Based on your job responsibilities, I thought you might be interested in having a chat about voluntary benefits for your employees. If that’s the case, let me know. In the meantime, I would be honored to have you join my network. I always close all three of those with this line, “In the meantime, I’d be honored to have you join my LinkedIn network.” I call that the phrase that pays. Stephen Dupont: Under the feature, My Network, I noticed that there’s a box that shows invitations. Sometimes I’ve noticed that people have sent me invitations to connect, but I’ve noticed that they have not actually looked at my profile. So, are these really people I want to connect with? Wayne Breitbarth: Well, they may not have looked at your profile today. But they may have in the past. Or, they may have looked at your profile using the Anonymous feature. I think it still boils down to this: you should connect with people whom, after looking at their profile, you think you can help each other. Stephen Dupont: What about invitations from competitors? Wayne Breitbarth: That’s an important question that everyone needs to think through carefully. Understand what it is you’re giving your competitor. You’re giving them access to your potential customers. Which means that it could be the worst strategy in the world for you. On the other hand, it might be a great strategy, because it could allow you to support each other and possibly collaborate. So you need to ask a few more questions about who’s in your network, what your settings are, what that person looks like versus what you do. That’s why it’s not a real quick answer, but I can tell you, it can be the best strategy, or it can be the worst strategy. Stephen Dupont: There are people on LinkedIn who identify as L.I.O.N.s (LinkedIn Open Networkers). For those reading this article, L.I.O.N.s are open to networking with everyone on LinkedIn. What do you think about becoming a L.I.O.N.? 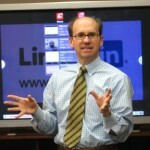 Wayne Breitbarth: Go back to your strategy for using LinkedIn. Here’s a good example. Let’s say you’re a job seeker, and you’re an engineer, and many recruiters are L.I.O.N.s. One day, out of the blue, you get a request from an engineering head-hunter that looks like he or she is spot on, in your space. It looks like they have a good reputation (based on their profile and the connections you have in common), but they’re a L.I.O.N. Well, that’s an easy one. L.I.O.N.s typically have big networks, typically of the kind of people you’re interested in having more of, so I would connect in a minute. Ask yourself these questions when deciding to connect with anyone: What is your strategy? Where do you think that the relationship could take you, or not take you? And then you can decide. It’s not a “yes” or “no”, L.I.O.N.s are bad or L.I.O.N.s good. It’s about how a specific L.I.O.N. fits into your strategy? Stephen Dupont: You mentioned this earlier, about building an email list. So you have all of these connections through LinkedIn, many of which include an email under their Contact information. Is it okay to build an email list from your LinkedIn connections? Wayne Breitbarth: The answer to that is, some of those people in your LinkedIn connection database should be on your company newsletter list, for sure. LinkedIn allows you to do a download into a spreadsheet of all of your first-level connections – including a connection’s primary email address. So, the capability is there. Now, what you do depends on laws, rules, and your morals. Because if you do send an email to a LinkedIn connection, they didn’t necessarily opt into your newsletter. That being said, they may or may not want it. Download your list and clean it up – remove people who probably won’t have any interest in your newsletter (such as those you connected with because you went to college with them, or church friends, or whatever). And then say, “If you’d like to get this on an ongoing basis, click here to confirm, or click here to opt out,” or whatever you do next. The bottom line is you’re using your LinkedIn data to at least get the ball rolling. But then you have to be respectful of rules and laws, and your ethics, and what you think you have the permission to do to move forward. But I think it’s a tremendous strategy if done correctly. Stephen Dupont: I’ve seen a lot of people talk about becoming a LinkedIn influencer. What is that exactly and how do you become an influencer? Wayne Breitbarth: So, there is a thing called, “The Official LinkedIn Influencer.” There are only about 500 of those people, and you and I are never going to be on that list. It’s people such as Barack Obama or Richard Branson. The reality is, out of 580 million people on LinkedIn, you’re not going to be one of those folks. Now, that being said, we should be trying to influence the network that we’re already attached to. So, we can become influencers in our own little network, and that’s a tremendous goal, and one that most of us should have as part of our LinkedIn strategy. To become a LinkedIn influencer in our world. Stephen Dupont: So, do you achieve that by joining and participating in LinkedIn groups? By commenting on various posts that others in your field have posted? Publishing articles through LinkedIn Pulse? Wayne Breitbarth: Yes, all of the above. Being an influencer is about sharing your knowledge. That could be through writing, videos, participating in discussion groups, or answering questions posted by users in their LinkedIn. This also extends to being professional with everybody that writes you back even though you’re super-duper busy. We all have knowledge. It’s a question of whether we’re getting it out of our head, into the minds of those we’d like to influence, and into the experiences of the people who are attached to us. Stephen Dupont: Many people ask, “What’s the difference between free LinkedIn, and one of the premium subscriptions? And, is it worth it to pay for a premium subscription?” What’s your take on that? Wayne Breitbarth: So, my take is that, you typically need to pay for LinkedIn, when you need to pay forLinkedIn. What that means is, you shouldn’t just pay for LinkedIn because you think something’s going happen that’s not already happening on the free account. Paid LinkedIn gives you more of the stuff that you’re already having success with, and at a level higher than free LinkedIn. So, for example, who views your profile? On free LinkedIn, as long as your settings are a certain way,you can see the last five people that looked at you. If that feature works for you – if that feature has turned into good relationships that lead to business – then you may want to get paid LinkedIn, because with paid LinkedIn, you get a full view of all of your visitors for the last 90 days. But, of course, only what they wanted to add in their settings. But you get to at least see the entry for every person for the last 90 days. So, that’s the kind of thing LinkedIn does. They give you a taste of some feature, and if you don’t need it a lot, that’s probably fine. But if it’s a feature that works, such as using its search capabilities, you’re going run out of free searches every month. So, for me, it’s going to be obvious when you should move to paid LinkedIn, because you’re going to become frustrated with some features because you want more. Well, that’s what your credit card is for. Don’t sit and bang your head against the wall, and be mad at LinkedIn. For $60.00 a month you can get all you want of the stuff you need to build new relationships that lead to more business. Listen for $720.00 a year, to me, that’s a bargain. Stephen Dupont: Speaking of “Who’s Looked at Your Profile” feature, what happened with Anonymous views? I always found it frustrated to see that someone, using the Anonymous feature, was looking at my profile, but now I don’t really see that traffic to my profile. Wayne Breitbarth: Yes. LinkedIn has quit showing us the anonymous users because we couldn’t do anything with them anyway. So, they’re just saving the data space on the page. But the question that you need to consider with the Anonymous feature is this, Stephen, should you be using it more often than you are. I use the Anonymous feature at least twice a month. And it’s because I want to look at people who I respect, who are in my space, and I want to see what their profiles look like, and I don’t want them to know I was there. So, to me, the Anonymous feature is a great setting for a period of time where you’re gathering intelligence and you prefer that people didn’t know that you were there. And so, there is a purpose for it. Now, that being said, if you’re using network to build relationships, I think you should avoid using it all the time because you want people to see you. That’s how we can begin the process of connecting and building relationships. Stephen Dupont: Wayne, in our LinkedIn feeds, we see messages and updates from people in our network. Do we just see posts from those in our network, or is LinkedIn delivering us posts based on the key words in our bio? So, for example, because I’m in marketing and PR, am I more likely to see posts outside of my network for those topics, than say, maybe if I were a lawyer, or worked in another profession? 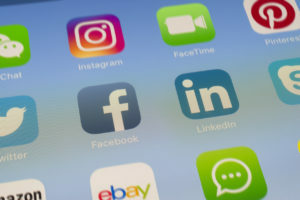 Wayne Breitbarth: So, the way it works is your feed should only have paid ads – anything that somebody paid to get in there – or things from your first degree connections. But people in second and third degree can get in there if your first degree liked, shared, or commented on that. So, a third degree cannot just show up unless they’re waltzed in by a first-degree comment, share, or like. Okay? But like you were just saying – the propensity to get information from your first-degree people who have previously liked, shared, or commented, or clicked on their stuff, will be much higher than those people who you have never looked at their stuff. LinkedIn also takes your profile into account. So, you’re onto something. LinkedIn’s algorithm does not give everything to everyone every time. Stephen Dupont: If there was one thing you could do to improve LinkedIn, what would it be? Wayne Breitbarth: I’d like to be able to customize my feed so I could just get posts from the 30, 40 or 100 people that I really want to follow. I’d love that. However, I understand that LinkedIn needs a way to pay for this stuff through the growth of its database (the number of users) and ads. Now, for an additional fee, you can do something like that. If you use LinkedIn’s Sales Navigator feature (a premium feature), it will let you create separate feeds, and only stuff that shows up in your Sales Navigator feed is the information from people you have pegged as a lead, or all of the companies you have pegged as accounts. Stephen Dupont: If there was one feature that LinkedIn has discontinued, and if you had the chance, to bring it back, what would that be? Wayne Breitbarth: Well, there’s a lot of those! But, if I had to choose just one, there was a feature called Amazon Booklist, which I really miss. That tool allowed you to keep a list of books that you read with mini-reviews. This list would be available for others to see. That tool helped me get a good chunk of my recommendations that sit on Amazon.com for my book. With that feature, I could put the title of my book in there, and it would show me every person in the world that had my book sitting in their Amazon Booklist on their LinkedIn profile. I would then send a message through my LinkedIn account thanking them for doing that and asking them if they would be so kind as to take their recommendation for my book at LinkedIn and put it on Amazon.com. Stephen Dupont: For the average person who is getting into LinkedIn – they’re trying to use it; trying to figure it out – how do you know if you’re being effective with it? With Facebook, Twitter and Instagram, people often measure success by the number of followers or Likes. What about with LinkedIn? Wayne Breitbarth: So, you’re right. Is it about the numbers or something more, such as the number of new customers you’ve generated through LinkedIn, or landing a better job? It’s hard to say. For example, maybe you connected with someone through LinkedIn three years ago, but it was one of several factors that brought you together and now that person is your client. It will show you your score between zero and 100, and then it breaks your score down into four different categories, each assigned 25 points. It will also show you how you rank against the industry you’re in, your own network, and show you how you can improve your score. The research that I’ve seen says that if you follow their advice, it will lead to more sales. It’s pretty cool. It reminds me of another feature that LinkedIn used to offer where you could see if your profile was trending within a peer group of other users in a specific industry, such as public relations or marketing. Stephen Dupont: What about the Profile Searches feature – where you can see how many searches that your profile has appeared in? Stephen Dupont: Why is that? What do you mean by that? Wayne Breitbarth: For example, right now my fifth word is Google. I do not have the word Google on my profile. Nowhere. So, it’s a little bit suspect, but I think the information in general is good to have. The thing that’s most frustrating about LinkedIn, really, is they have so much data on us, but they’re not willing to share it. Wayne Breitbarth: So, like, there’s a feature in Sales Navigator. You’ll like this. Once you put people into your Leads List in Sales Navigator, you will get a ping from LinkedIn if anybody on your Leads List looks at your profile. That’s pretty cool. So, that – that feature exists. Now, you have pay at least $80.00 a month to get it, in Sales Navigator. It’s just what you just said – if they come up with a product, then maybe they’ll show that to us. Stephen Dupont: Even if you’re not actively looking for a job, do you think you should change your profile to let recruiters know that you are open to opportunities? So, my question is, so what if you do this and the HR person from your own company sees that? Could that be a little bit awkward? Wayne Breitbarth: It isn’t, “Could it be?” It will be. There’s a button in the job section, under Career Settings that you toggle off and on. LinkedIn warns you right away. “We can’t control people at your company knowing you just pushed this thing to ‘on’.” If it’s a risk you’re willing to take, go for it. Stephen Dupont: Wayne, how important is it to have a headshot and background photo in your profile? Wayne Breitbarth: Well, based on the latest research from LinkedIn, your profile will be viewed 20 times more often if it has a profile photo. So, I think that says it all. Stephen Dupont: Well, what about those who might be a little bit worried about ageism in the workplace? Wayne Breitbarth: Well, here’s what I think about that. Sooner or later, you’re going to be 60. In other words, you’re going to have an interview and the people interviewing you are going to figure it out. So, if the other party has a discrimination mind-set to them, then why not flush that out early, and don’t waste each other’s time? It’s illegal, but you know it goes on, so I say, flush it out as quickly as possible. If an organization doesn’t want to work with or hire 61-year-olds, I’d rather know that right now so I’m not wasting anymore of my time with that organization. Stephen Dupont: How important is that first line – the headline – that identifies who a person is on LinkedIn? And how should you best use it? Should you put your title there? Or should you put something like, “I’m an expert in accounting.” Or should you focus or talk about an industry? I mean, is that first line where the key words matter the most? 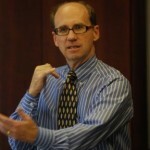 Wayne Breitbarth: The headline is one of the three hot spots for keywords. It’s also one of the best spots for really telling your quick story. So, you need to juggle key words versus story sometimes. And you just have to figure out to use that chunk most efficiently. 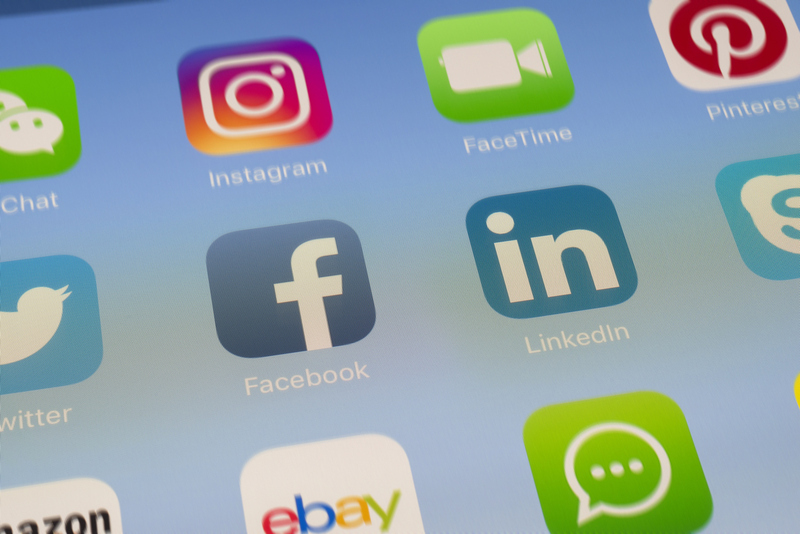 Stephen Dupont: How do you recommend using LinkedIn with other social media, such as Facebook, Twitter, Pinterest, and Instagram? Wayne Breitbarth: I think you should use other social media along with LinkedIn because I think they all work well together. For example, we can write an article on LinkedIn, and use that link from the article and promote it with a Facebook post to come over to LinkedIn and read the article. As long as you understand the audiences on the platforms, and what your objective is, that interrelationship can work great. Another example: I use Instagram, and I use it almost exclusively to take somebody somewhere else, to a space (my website, my LinkedIn page) where I have a lot more information about what I’m trying to do. The same for Facebook. I don’t spend a lot of time on Facebook, but I use Facebook as a place to bring people to a different spot. So yes, working all of these social media tools should definitely be part of your strategy. Stephen Dupont: You brought up the LinkedIn articles. How effective are those articles, especially when it comes to building one’s expertise or credibility? Wayne Breitbarth: They can be. But, if you only have an audience of 150 people it might not be the best tool in the world. If you have an audience of 1,500, it’s ten times better. Regardless, I love that feature because it’s free and available for all LinkedIn users. And for those who become serious about using LinkedIn for business development or career building, it absolutely should be a part of your strategy. Stephen Dupont: What advice would you give younger people – those in high school or college – about using LinkedIn? Some say: “Well, I don’t really have a great résumé yet. So, I don’t know if I should be on there,” or, “I haven’t done anything real yet,” or “I’m not really a professional, so I really shouldn’t be in there.” How do you recommend high school and college students use LinkedIn? Wayne Breitbarth: The minimum age that a person can be to start a LinkedIn account is 14 years old. High school students should build up a profile, and then you should start connecting with people that you know and will want to stay in contact with over the course of your career, regardless of whether you go to college or not. For those who go onto college, you need to take the time to really get to know how to use LinkedIn to help you start finding internships and eventually a full-time job after college. Remember, the people who are doing the hiring will be looking at your LinkedIn page before you come in for an interview, and very often, they’re using LinkedIn to scout potential job candidates. So, here’s my advice for college students: By the time you reach your sophomore year when most students are starting to compete for internships, you should work hard on writing your profile. And, your should be actively networking – connecting with other students, professors, friends of your parents and other relatives, alumni, and professionals in the industry that you want to pursue (such as when a professional comes to campus to speak). At some point you need to approach LinkedIn as “something I’m learning how to use” to starting to actually using it as a tool of building your personal brand and getting internship experiences. By your senior year, you ought to have several hundred people in your network, and you ought to have a profile that’s keyword-optimized. Stephen Dupont: Do you have any concerns about the direction that LinkedIn is taking? For example, that people are trying to use it like Facebook? Wayne Breitbarth: Well, I don’t worry too much or think too much about that, because LinkedIn has its own objective. And I hope it’ll coincide with us business professionals as they move forward, even when we’re not looking for work. LinkedIn can decide to take the platform a different way, so that it may not serve our purposes. Or they could decide to enhance the businesses of LinkedIn, better than they ever have now that Microsoft owns LinkedIn. So, as much as I can get wrapped up in this little thing and that little thing, I still go back to this: as long as LinkedIn is the largest database of business professionals that we can access – and most of us can access it for free – it’s going to be one heck of a tool regardless of these little things that they do, and tweak, and change, and all that. For one thing, there’s a lot of artificial intelligence in the background of this platform to keep it from looking like Facebook. For instance, you used to see a lot more puzzles, and silly little game things, and those don’t show up as much. They’ve found a way to keep those games and puzzles out of our feed, and keep your feed focused on business. Stephen Dupont: Wayne, for those who would like to learn more about you, your book and your online courses, where should they go to get more information? Wayne Breitbarth: My website is the best, which is PowerFormula.net, or check out my page on Amazon. Stephen Dupont: Thank you for sharing your insights Wayne. I appreciate it.